We now live in the world where the climate is constantly changing, and we need to be flexible for these situations. The cold weather is coming soon, and a heater becomes a mist. 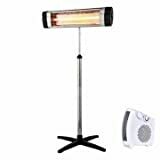 And, sometimes, you want to have outdoor activities, but you find difficulties in getting a high performing patio heater that is suitable for both outdoors and indoors. To aid your selection, in this article, our team will introduce to you the 10 best patio heaters for outdoor and indoor in 2019. Read on to learn about these picks’ desirable features. This best heater from Giantex can help you warm your veranda whenever you want to have your outdoor activities such as pool parties, dinners or any playground activities for your kids. This product comes with a sturdy stand. It is made of stainless steel to protect against the air and sun. And, it is available in 2 colors – black and bronze. Plus, you do not worry about portability because this heater has side wheels, making it easy to move. For your information, its dimension is 19 x 19 x 29 inches. Its heat output is 41,000 BTU. This best patio heater burns fuel to make strong energy; that is how it produces the heat. Here is another bigger patio heater named AZ Patio Heater. Its dimension is 38.5 x 21 x 21.5 inches and it has 65.2 pounds of weight. What’s more, the heater can be operated to 8-10 hours with its 20 pounds propane tank. Its heat output is 40,000 BTU’s. This item is used with two types of gasoline like propane and butane. 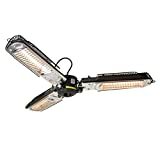 Here we have another best patio heater comes from same brand AZ Patio Heater. But, this one is a different model with its number: HLDS032-B. Moreover, this item is colored in stainless steel that could help with the door decoration in your home or your backyard. Its size is only 20.87 x 37.8 x 20.87 inches and the weight is lighter with only 17.1 pounds. Its heat output is 11,000 BTU’s. You will get the very good quality and 1-year warranty on this product. This is one more patio heater from brand AZ Patio Heater, but this one comes in a fairly large size of 32 x 87 x 32 inches size and weight of 46.1 pounds. It has hammered bronze color with a different outlook that with the model number: HLDS01-WCGT. It has wheels attached to it that are easy to move around and is backed by a1 year guarantee. It also gives you a table for your patio as well. And, for the heat output, it is 41,000 BTU’s. There is a small patio heater coming from the manufacturer called Mr. Heater Corporation. Its dimension is 9.8 x 8 x 12.8 inches, and its weight is only 3 pounds. Thus, it is easy to move to anywhere you need heat. You can have it in your small store or any indoor, and this product can be connected directly to the 5-20 pounds gas tank. Its heat output is from 8000 to 15000 BTU’s. You also get a 1-year warranty if you purchase this best patio heater. One more innovation coming from AZ Patio Heater is different from the products described above because it is powered by the electricity. This item is to be attached to the user’s patio umbrella. It is made for different temperature controls. This electric patio heater has 3 burners, and it could spread the heat up to 15 square feet of space. It weighs only 10.8 pounds and sized to 40 x 40 x 6 inches. It is not only for outdoor purposes, but you can also use indoors, too. 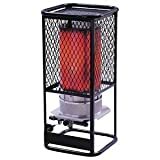 This best patio heater is another innovation from Fire Sense manufacturer, which is also powered by the electric. Therefore, its operation is also less than that of propane patio heaters. This product is resistant to any weather because it is made of tough stainless steel. It comes in the size of 87 x 22 x 33 inches and the weight of 55 lbs. Even though it is big, it is easily moved because of the wheels attached. Let’s take a look at another electric best heater manufactured by E-Joy. This one is designed to have 3 different kinds of heat modes, and it is not dangerous to use compared to fuel-operated propane patio heaters. This item is produced with durable aluminum and weatherproof material. If you get this remote control patio heater, you will be given an offset pole that allows the heater to stand freely. This electric heater has the dimension of 65 x 24 x 65 inches, and it is weighted to be 19.6 pounds. Now, let’s move to the propane heater which is from the brand named Heatstar By Enerco. It comes in the weight o 36.9 pounds and it is measured 16.1 x 16.4 x 35 inches big. The special thing about this product is its heating coverage is 30000 square feet. The heat output is 125000 BTU per hour. This product is quiet when it is working, and it can be moved to wherever you need warmth. This 11 x 11 x 23.6 inches electric heater is the last item of the list, which is from EBI the manufacturer. Its weight is 15.2 pounds. With this one, the operation costs you less than propane heaters, and you could save the environment by not burning fuels. This product is made to be waterproof and dust-proof, and it is resistant to the wind as well. You do not worry about the noise and removability, and it looks nice to be under your table. The heating power is 900 watts. And, this best electric heater is also backed by a 1-year warranty. There are many best patio heaters recommended above with either electricity or fuel operation and with various size options. These patio heaters are the best products that we have carefully picked for you in the list of 2019. Thus, you do not need to worry anymore when you want to have your outdoor activities to enjoy under the sky at night or stay anywhere in cold weathers. So, get one soon while stocks last.